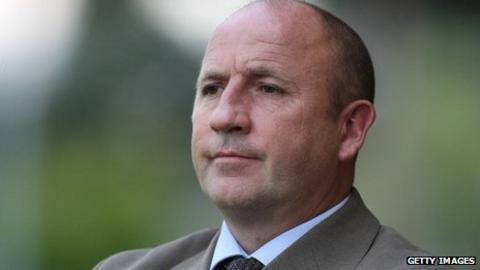 Rochdale have appointed Accrington Stanley manager John Coleman as their new boss. League One Dale made an official approach on Sunday to Accrington for the Liverpudlian, who had been in charge at Stanley since 1999. Coleman, who had a contract at Accrington until 2015, told Rochdale's website: "I'm ambitious and I want to compete at the highest level I can. "It is a big ask to keep Rochdale up, but that's what we want." He added: "We want to be playing in big games, playing in entertaining games and I think we've got that opportunity here. "My main focus is Bury on Saturday. That will take us a baby step towards the immediate short-term aim, which is survival. "We are trying to get a bit of belief in them [the players], let them realise it's a new start for everybody and they've got the opportunity now to get people talking about them for the right reasons." Caretaker boss Chris Beech had been in charge at Spotland since Steve Eyre left in December. Dale have struggled in the league this season and lie 23rd in League One, four points from safety. Last year, under the management duo of Keith Hill and David Flitcroft, they managed a ninth-place finish before the pair moved to Championship side Barnsley. Accrington currently sit 10th in League Two, just two points off the play-off places. Coleman, and assistant manager Jimmy Bell, joined the Lancashire club in 1999, taking them from the Northern Premier League First Division back into the Football League and reaching the League Two play-offs last season. Speaking after Saturday's goalless draw at Aldershot, Coleman told BBC Radio Lancashire: "If the sum of your ambitions is to manage in League Two with a club who are on a small budget, I think our club wouldn't benefit from it. "If our club didn't realise I was ambitious we'd possibly still be in the UniBond."